I have a creative muvo tx 1gb, Ive listened to ipods and irivers and my little mp3 sounds just as good as them and it was only half the price. Think i paid £70 for it. The headphones are not as good as some that can be bought, but are fine for most types of music. It has a 5 band equalizer, 5 presets and a voice recorder. But 1 of the best features about it is the fact that it can be plugged into any usb port on any pc and without installing drivers you can copy info to and from it. 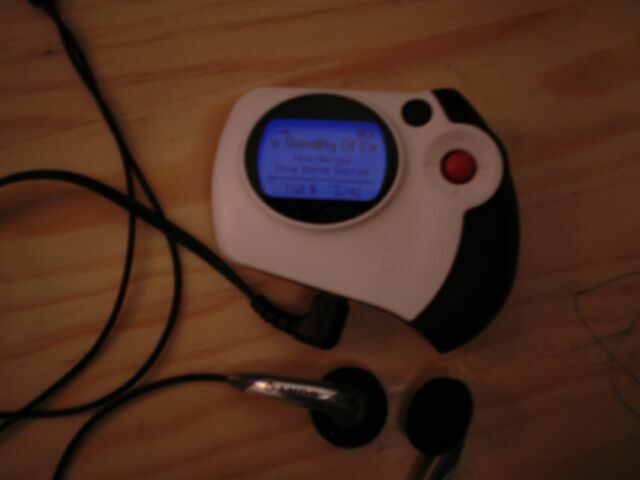 I have a Rio chiba with 128Mb internal and a 256Mb MMcard with Sony headphones and it rocks my world! @aghast who that person in your avatar? PErhaps sound quality is something personal. It also varies an awful lot on the music you listen to. A classical music listener really would need something of extreme quality. Perhaps you should wander down your local Electronics store and ask for demonstrations. Richer Sounds even have demonstration rooms, albeit not for MP3 players I don't think. Anyway ya it really depends on what your listinging to rap, classical usally need good rock blends anyway unless you have an x-fi. To be honest, if you're after sound quality, a) you'd avoid any device that used compressed formats; and b) you'd avoid any device with "equalisation" on it. Having said that, a graphic equaliser that's good enough to compensate for speakers/rooms/headphones will have at least 31 bands. Thus, a 5 band or 10 band graphic equaliser is way too blunt a weapon to tune out resonances, so it becomes a consumer gimmick instead. I was referring to this one. There is also a 20GiB version for less. It is a UK site though, so its only for reference.